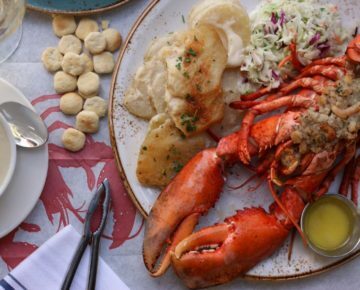 Whether staying at a fancy hotel or aboard a luxury cruise ship, I’ve always been a sucker for a traditional afternoon tea service. I just love the scrumptious little sweet and savory bites that accompany a pot brimming with hot tea. I also adore the beautiful china and the fact that you can get away with wearing a ridiculously large hat if the mood strikes you. 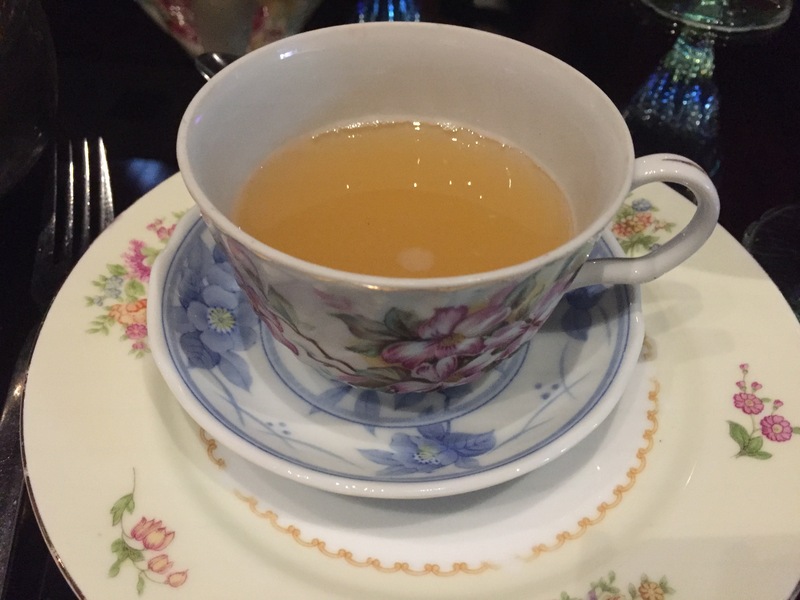 So when I heard that the trendy Camby Hotel in Phoenix recently began a tea service in its bar (called The Bees Knees), I immediately looked into it. And much to my surprise, I discovered that this was no ordinary tea service. This is a boozy tea party — called Tipsy Tea — which is a modern twist on a traditional high-tea that might make your grandmother blush. As you can imagine, I promptly booked a reservation for myself and 9 girlfriends for this past Saturday afternoon. The Camby provided me with a complimentary tea service. All opinions, photos and text are my own. Please read my disclosure policy for more information. Upon arriving for our 3:30 pm tea time, we were escorted into the beautifully appointed Bees Knees bar. 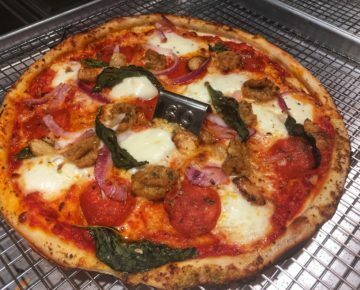 The furnishings and fixtures are somewhere between posh and casual elegance, allowing us to comfortably settle in and peruse the menu of options. 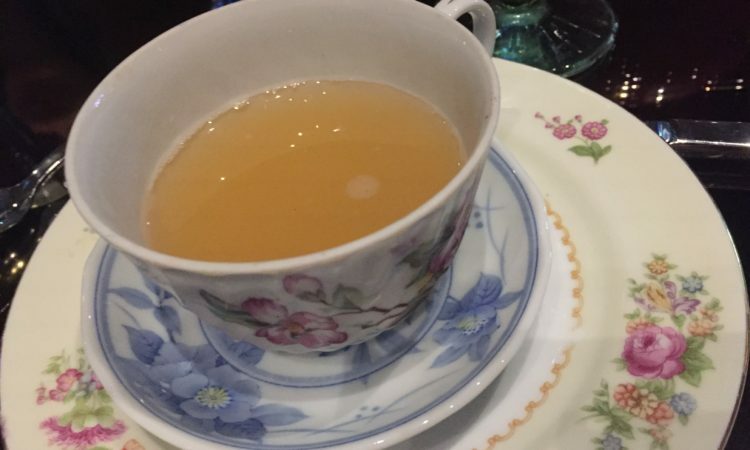 You have a choice between four Tipsy Tea Pots, which are chilled tea-infused cocktails, and three Tea-Infused Champagne Cocktails. They all sounded amazing, making it difficult to choose … thankfully this was the ONLY decision we needed to make throughout the tea service. I ended up selecting the Buzzing Lotus, a white lotus infused gin cocktail with honey syrup and lemon juice. I watched as the bartender across the room began making our beverages in traditional cocktail shakers. But instead of pouring them into cocktail or martini glasses, they went straight into a beautiful teapot! 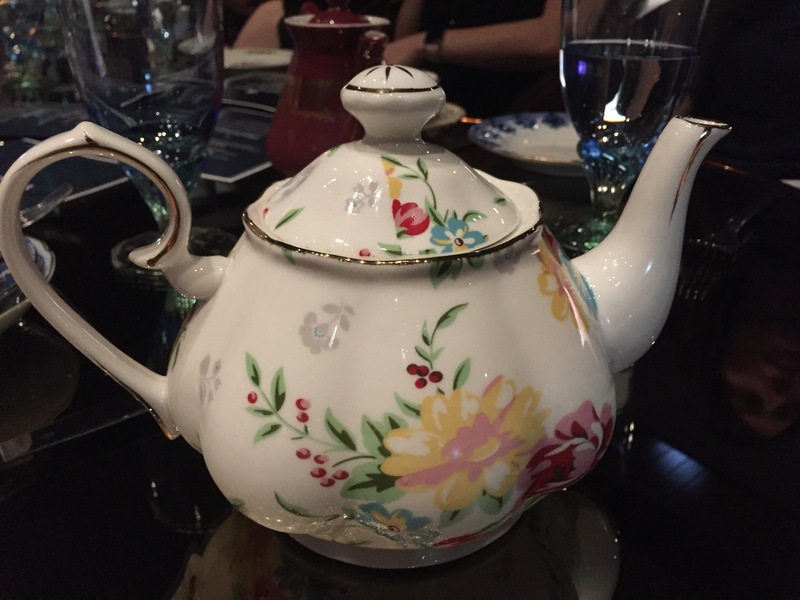 Each guest receives their very own teapot filled with whatever delicious concoction they selected, so there’s no need to share. 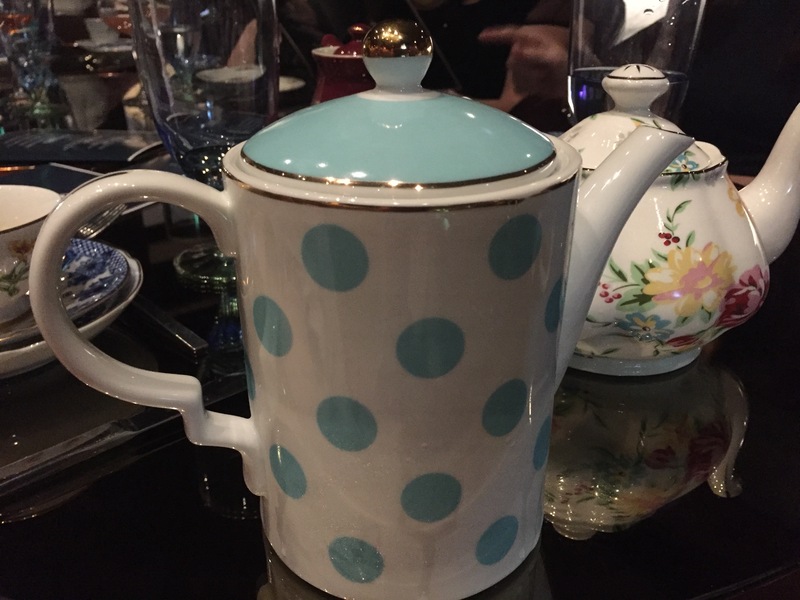 Isn’t this the most adorable Tipsy Tea Pot? 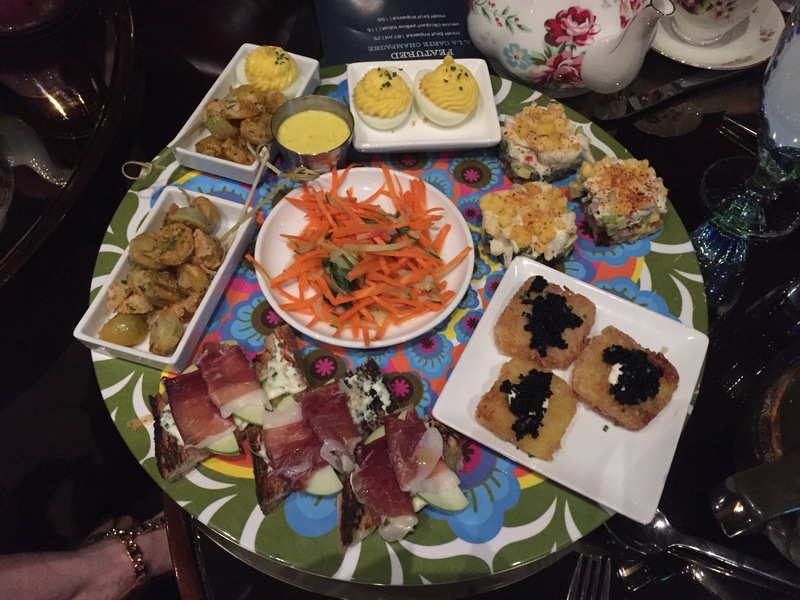 While we were all enjoying our “tea,” the wait staff delivered enormous platters of savory appetizers. 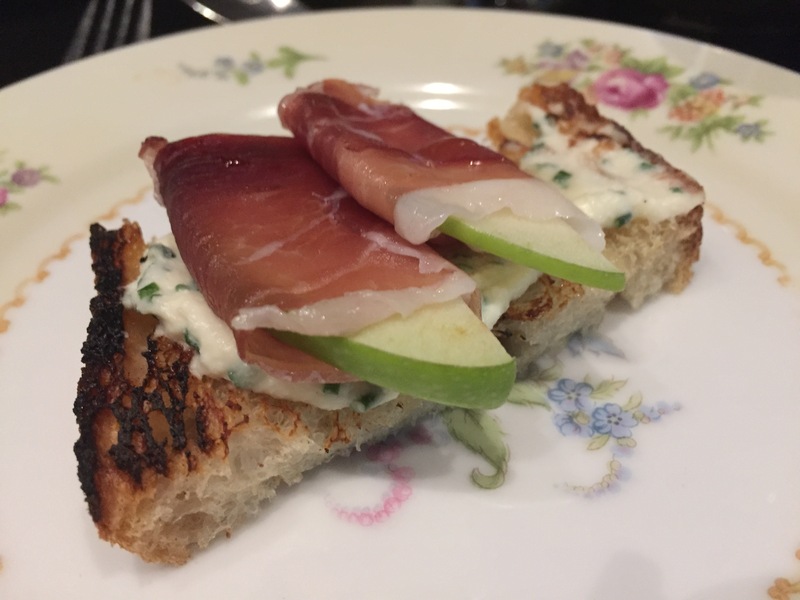 As you might have guessed, these are not your typical dainty cucumber sandwiches. Instead, they served mango crab avocado sliders, truffle deviled eggs (positively divine! 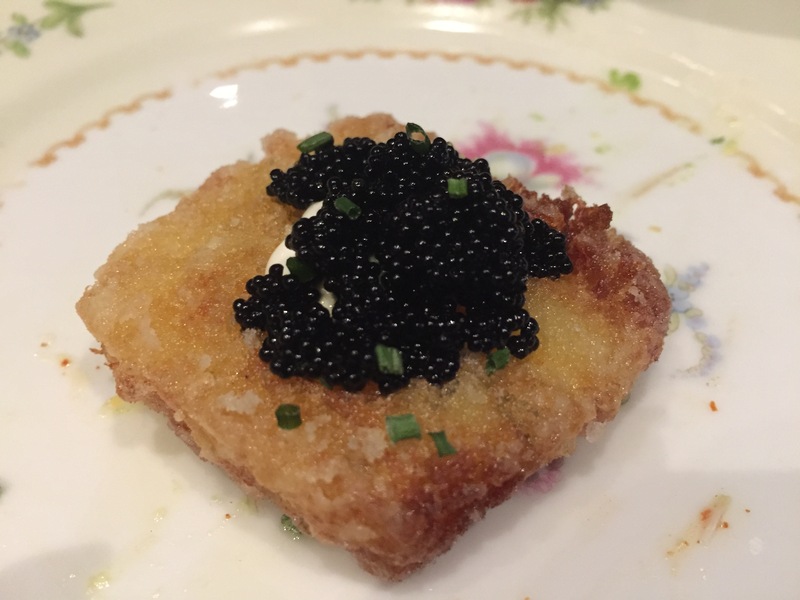 ), tater tots with caviar, and herb ricotta and Iberico lomo bruschetta. Again, there’s no need to politely divvy things up (can you tell I hate sharing my food? 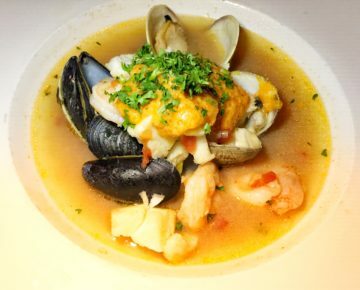 ), because each guest is served one of every dish. 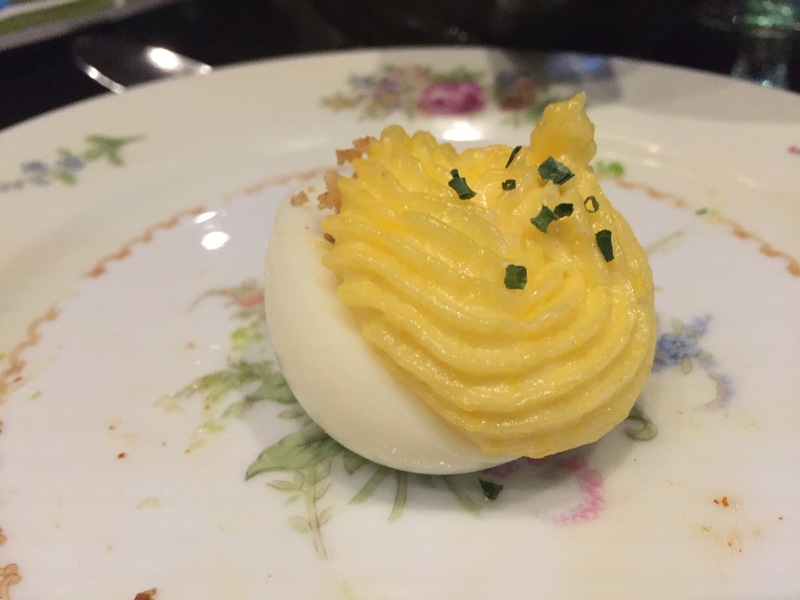 The truffle oil on this deviled egg was to die for! We spent a good hour sipping our yummy libations and sampling the heavenly bites, trying out our best fake British accents. Such a sophisticated bunch, we are. Honestly, I must have poured the contents of that teapot into my teacup four times before it finally ran dry. Confession: I’m a lightweight, so the generous pour meant I was already getting tipsy by cup number two. Enjoying my Buzzing Lotus … and nearly buzzing myself! Lastly, the pièce de résistance arrived: the sweet treats. 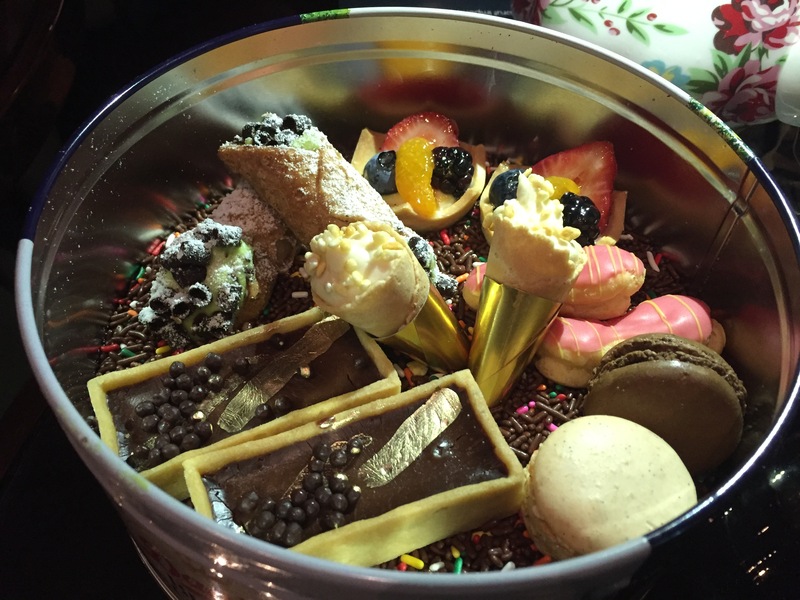 They were impeccably displayed in cookie tins, lying atop a bed of sprinkles. So clever! And we’re not talking about traditional dense scones, either. Instead, we enjoyed pistachio cream pie, cheesecake “ice cream cones,” chocolate pot de crème and French macaroons. 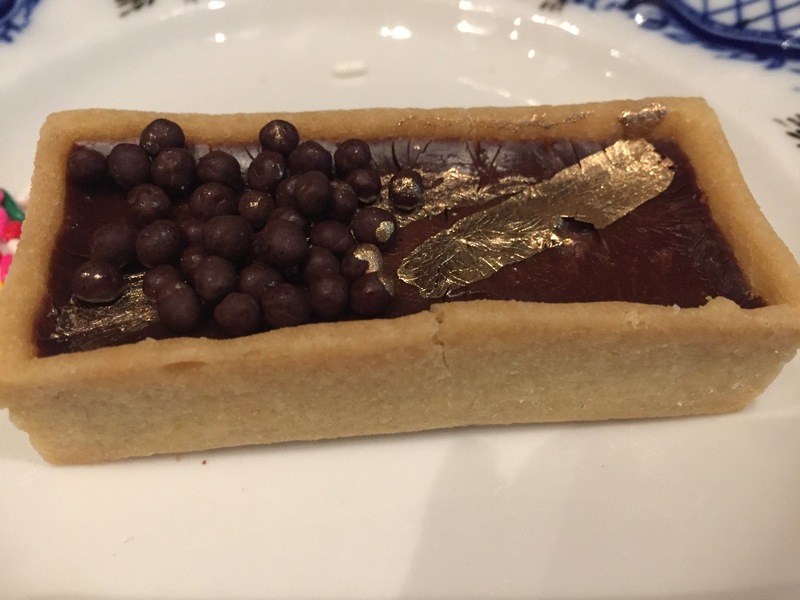 Each bite was decadent and perfectly portioned. This chocolate pot de creme was topped with crunchy chocolate balls. Isn’t the gold luxurious? 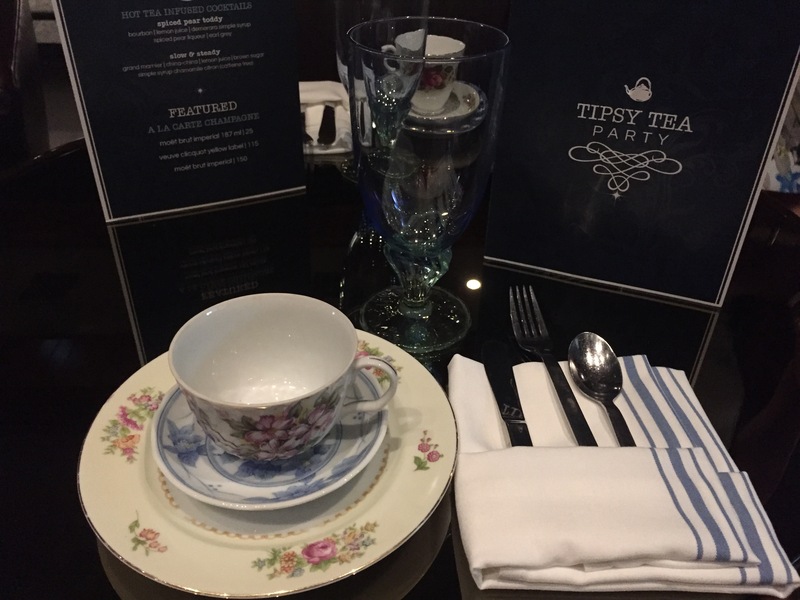 We thoroughly enjoyed ourselves at The Camby’s Tipsy Tea party and many of my guests discussed coming back for future birthdays, wedding showers or with their mothers. 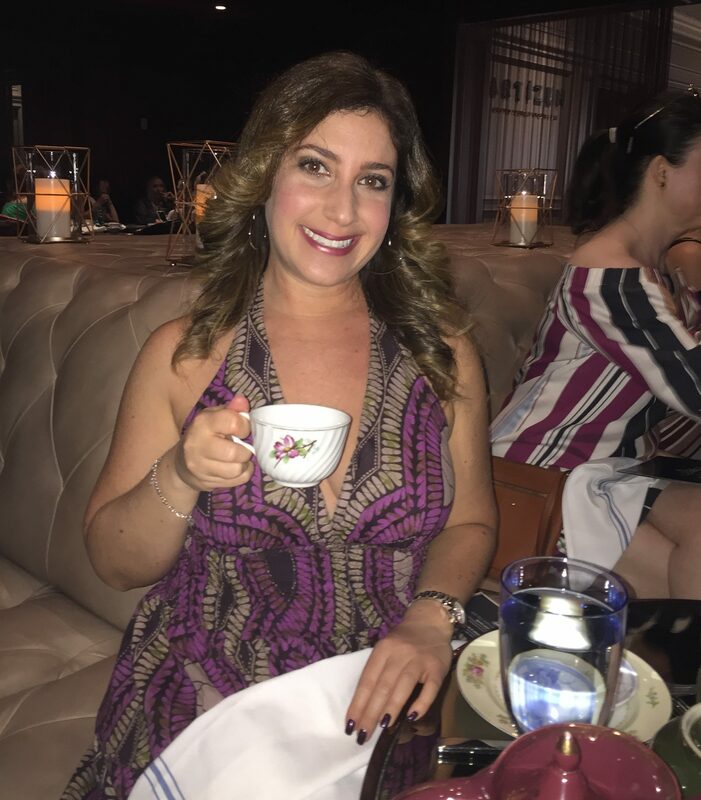 As for me, I was completely spoiled by the exquisite experience and may never be satisfied with a traditional “virgin” tea service again. Beautiful tea party! I got this place on my list. Looks better than their rivals! 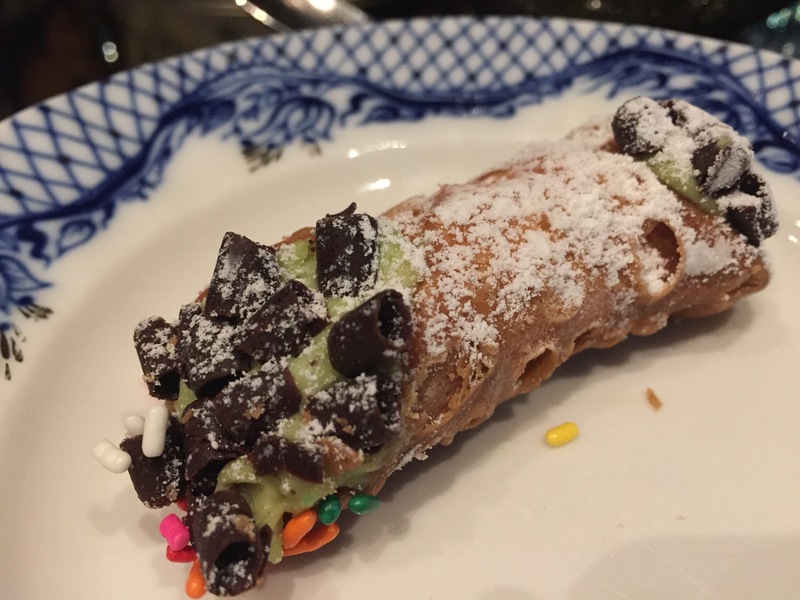 It was SO fun … all their pretty china patterns and delicious treats made for SUCH a fun experience!